In my continued efforts to eat healthy and save money simultaneously, I opted for one of my favorite dishes – Chicken Marsala! While this can typically be a high-calorie meal at traditional italian restaurants with the significant amounts of oil and butter, there are easy steps to keep the delicious taste and cut the calories! After cutting thin chicken tenders, cover them with some flour (I used whole wheat) and salt/pepper. Then, add them to a hot pan with some olive oil and brown each side (approximately 3-5 minutes per side depending on thickness.) Once browned, remove them from the pan and keep warm. Once sauce thickened, I added the mushrooms and chicken tenders all together in the pan and spooned the sauce onto the tenders for consistent flavor. I cooked on low-medium heat until chicken was cooked through and flavors from the wine were released by the heating process. 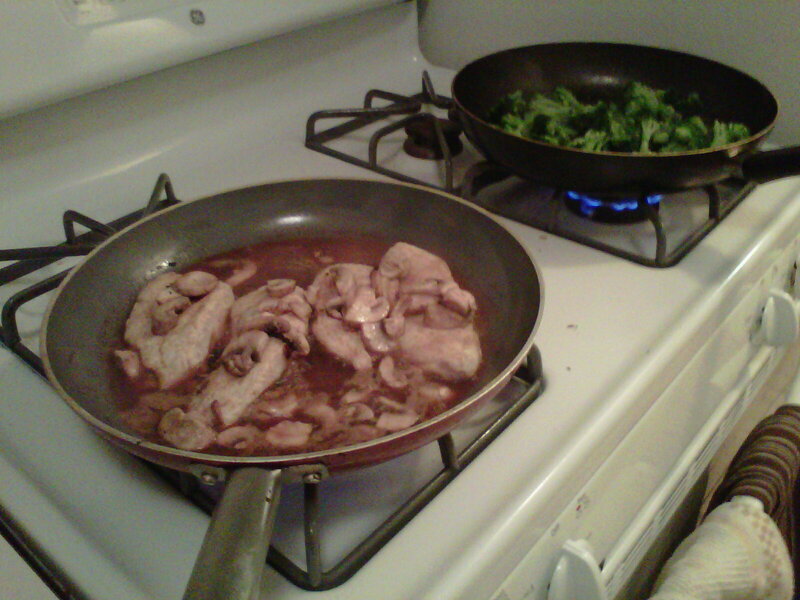 In a separate pan while the chicken cooked, I did a vegetable stir-fry with yellow peppers, broccoli and onions. I added a small amount of the low-sodium chicken broth and a dash of salt & pepper for more flavor. After about fifteen minutes, the result made for surprisingly delicious and satisfying meal. I’ve made this dish before, except I used red wine this time instead of white wine as the base for the sauce. 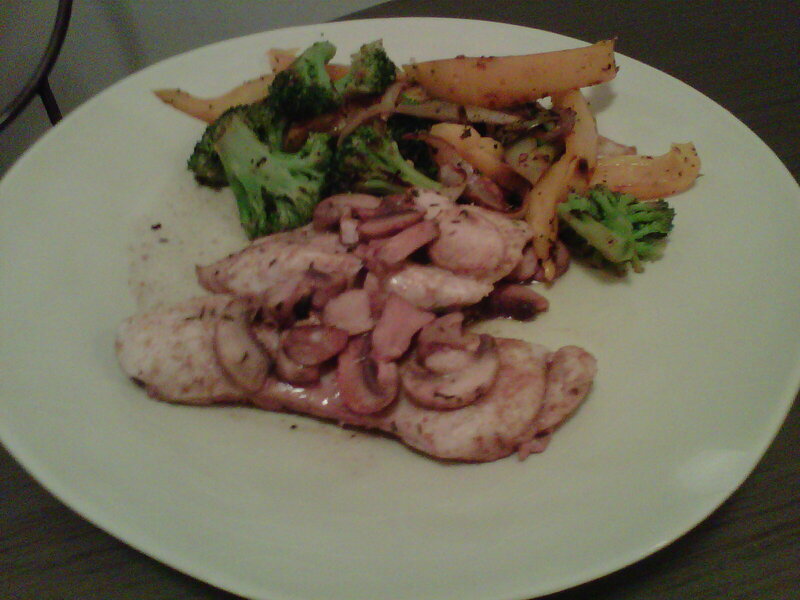 It actually gave the overall dish a more powerful taste – I even used leftover sauce for the sautéed vegetables! 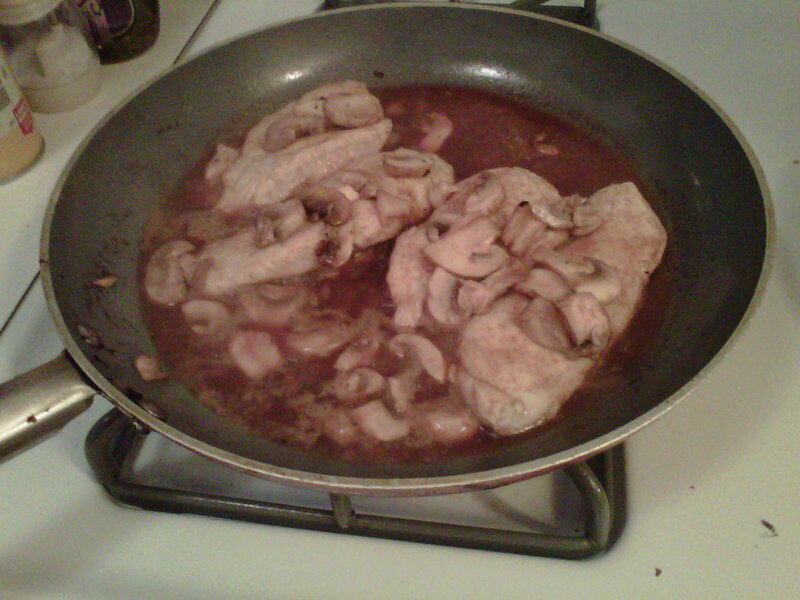 This entry was posted in Food, Health and tagged chicken marsala, chicken marsala recipes, low-sodium chicken broth, pinot noir, red wine, sauteed vegetables, Trader Joes by adlevine. Bookmark the permalink.